Using a torch in a studio is easy. Especially butane torches. Check out these free videos I made with Beaducation on how to use a butane torch and how to set up to work with a torch at home. But what if you want to use a bigger torch, like an acetylene torch? Larger torches are great for annealing, soldering bigger pieces like bracelets, and for melting your scrap into ingots. With the larger, hotter flame comes more need for safety. But with around $50 worth of simple parts from a hardware store and about 30 minutes or less of effort, you can make a fire resistant torch station. 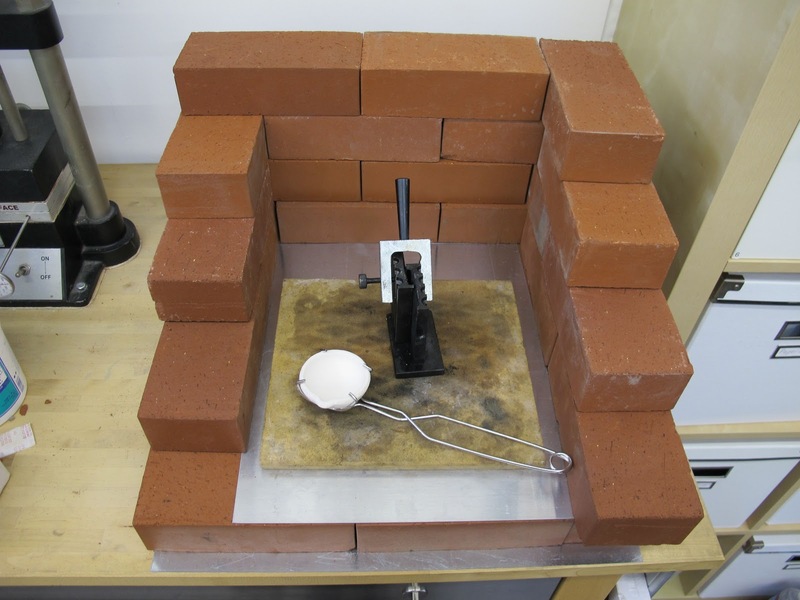 This torch station I made for our studio at Silvera Jewelry School is made up of simple red house bricks, and 3 sheets of thin gauge sheet steel (18 gauge). How many bricks? That depends on how big of an area you want to enclose. The average brick is 8x4x2.25 inches. For my set up, I used about 12 bricks for the base, and another 16-18 bricks for the partial wall around the firing area. The sheets of steel were about 12x18". I made my torch station on a counter top for working with the torch while standing. 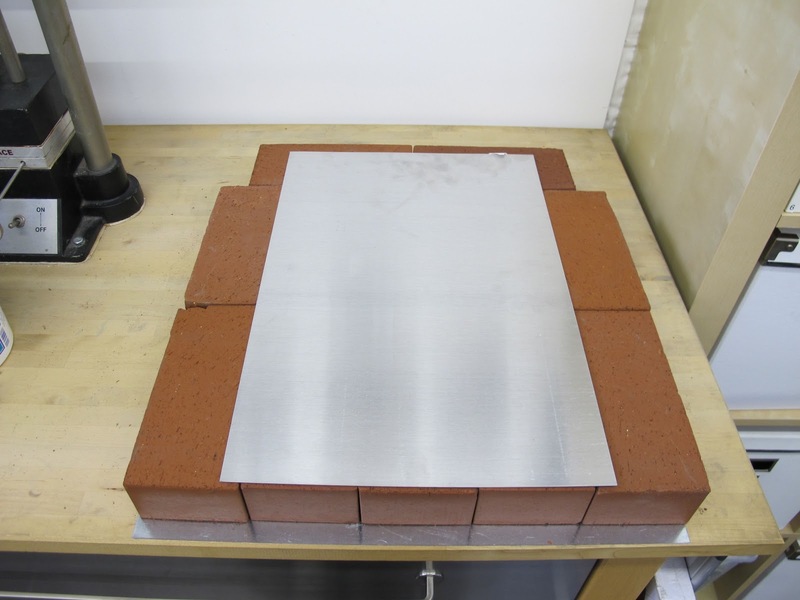 I placed 2 sheets of steel on the table top, to protect the surface from the bricks. 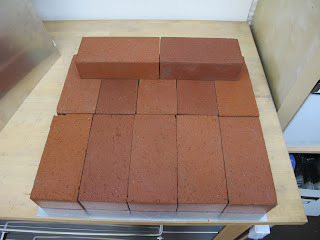 I laid out 12 bricks on top for floor of the torch station. Next I put another sheet of steel on top of the brick base. This not only is extra protection while using the torch, but helps to keep small bits of metal from falling between bricks! Then I started building a partial wall around the sides. The wall is higher in back and slopes down towards the front on the sides. This helps to protect everything around you from the flame as your working inside the wall of bricks. The weight of the bricks keeps them in place, but if you're working in a place that is mad for earthquakes, you could think about gluing the whole set up together with mortar. I put a large solder board or kiln shelf on top of the sheet metal. Working directly on the steel can warp it and compromise the work area. It's better to work on a solder safe board or annealing pan with pumice. Working with a torch can create some fumes, especially from fluxes when heated. Fluxes can release chemicals, like fluorides, which can be harmful after frequent exposures. Having plenty of ventilation and circulation of air around your torch station is recommended. Installing a simple hood or even some ducting connected to a fan in a window can draw those fumes away from you. If in doubt about your ventilation, use a lightweight respirator to protect your lungs. You only have two of them! Also, before using a tank torch, like a propane or acetylene, be sure to read, follow and understand all the instructions for safe set up and use. Secure the tank to something heavy so they don't fall down. Always play safely with fire, like setting up a safe work area. Thank you. Wonderful information. I wish I would have read this before I spent so much money on other ways.